Two members of the Northern Group visited Portugal on 13 February with two Irishmen, Brian Duncan and Mark Reid. We landed in Lisbon and found that it had been not only very cold but also extremely dry through the winter. 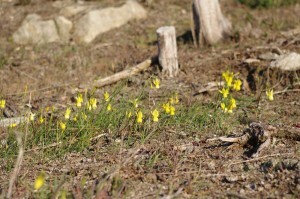 In Setubal the bulbocodium that grow along the coast were just emerging. Above are the calcicola we saw around Minde, growing over a very wide area. 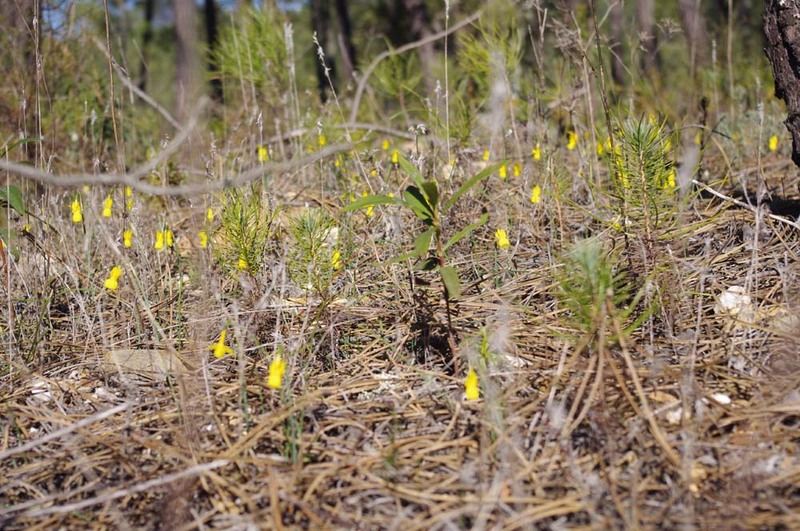 This time we climbed up into the rocky scrubby hills and found them plentiful despite the dry conditions. 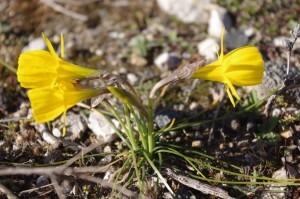 These are some of the triandrus growing above the town of Portalegre. This site is exceptionally interesting because of the variation in colour and form of the population. The flowers are a mixture of N. triandrus pallidulus and N. triandrus concolour (N.lusitanicus) and a variety of hybrids formed between the two. We spent parts of two days at this site, marvelling at the variety of forms. They are growing in very unstable damp shaly soil which had had the brambles chopped at some point and left lying, making for some uncomfortable thorny encounters. Well worth it though. 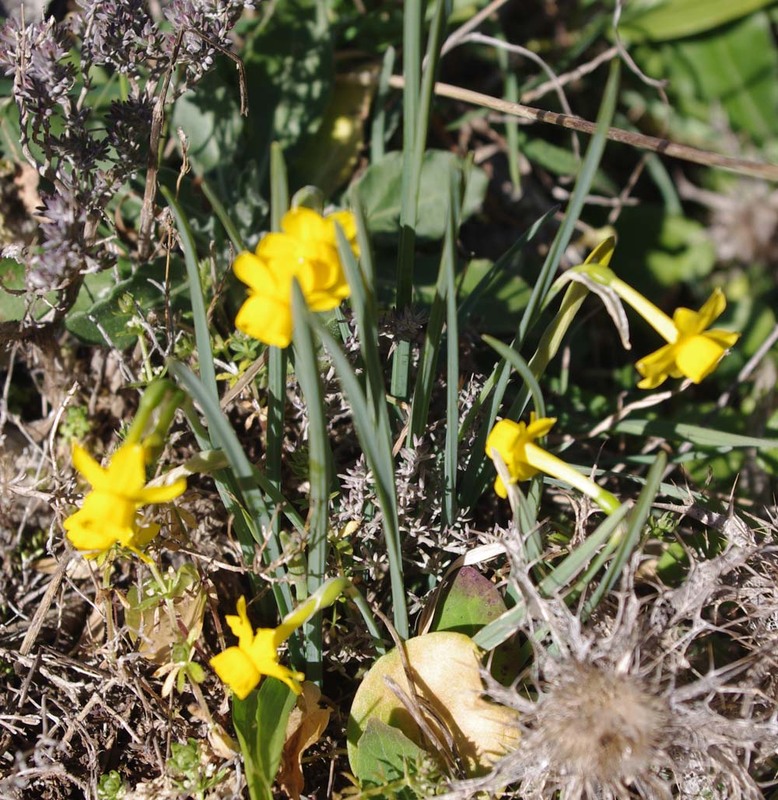 The tantalising prospect of finding N. portensis never leaves your mind as you travel towards Oporto and on this occasion, just as we had decided once and for all that it was a wild goose chase we had a sighting of flowers that raised our hopes once again. 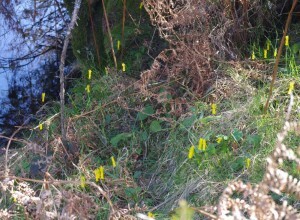 We weren’t looking for it, in fact we were following an AGS sighting of flowers near a dam on the River Zezere. This was one of those endless high scrubby mountain treks that seem to be leading nowhere. We kept losing the river and resorted to following an enormous pipe that we thought might be taking water from the dam for hydro-electric use. The name of the dam was Barragem de Santa Luzia and we finally found it. It was pretty spectacular. One end of a granite cliff that reared up out of the top of the mountain had been sculpted and melded with the usual massive concrete shell to hold the water. Evidence of the drought was seen in the water which looked to be about 50 metres lower than usual. 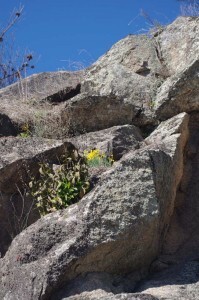 We walked out across the top of the concrete and eventually were underneath the granite cliff. Out of reach above our heads was a clump of flowers that made my heart stop. 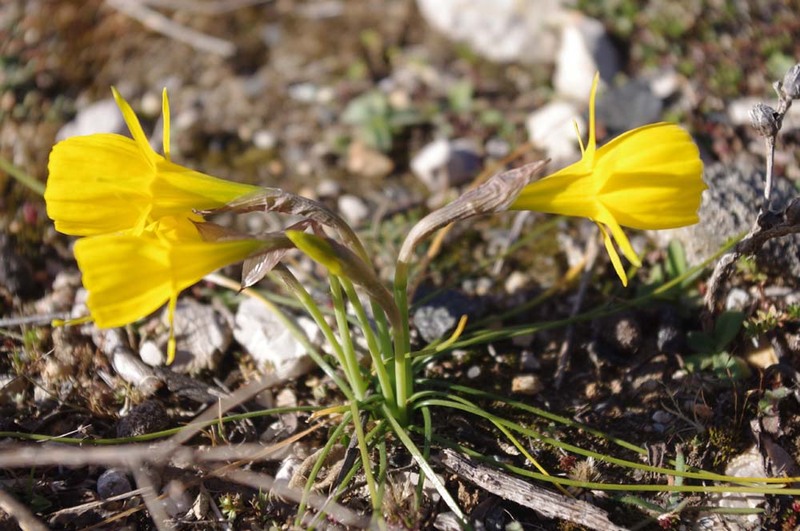 At first glance it looked like a pseudonarcissus, growing almost horizontally out of a rock crevice. The thing was, it didn’t look like anything we’d seen before. 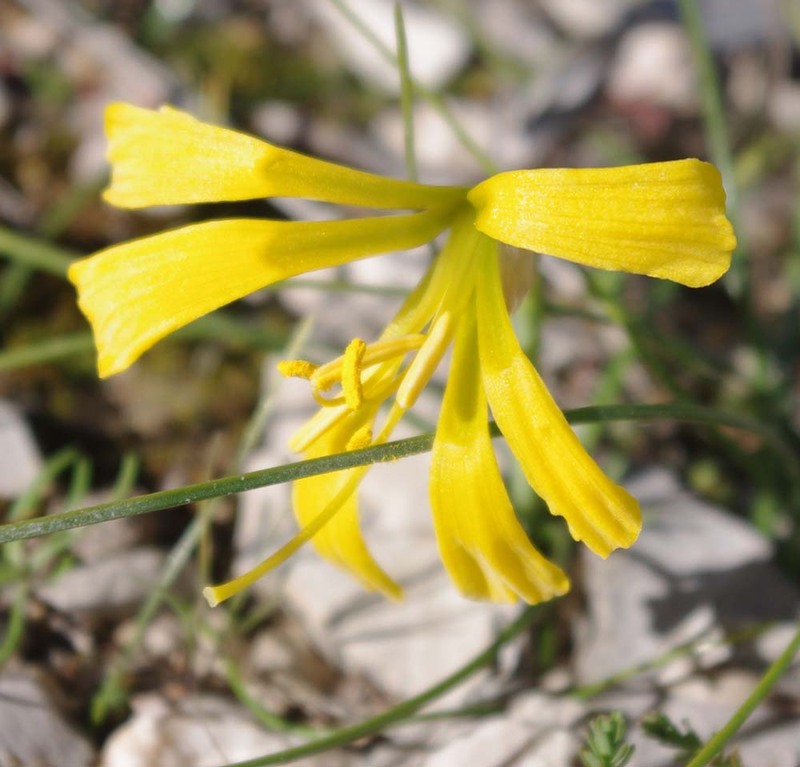 When you see a hard to identify plant you run through the list of flowers that you know and it simply didn’t fit anything. We were desperate to get a closer look, in fact James went off and found a fallen tree in a nearby copse and dragged it to the cliff in hope of using it as a ladder but it was still just too far away. I must admit at this point I thought we must look a bit like an episode of “Last of the summer wine”. There were more clumps growing even farther up the cliff but we had to content ourselves with a photograph. We found a way to the other side of the cliff but it looked even more inaccessible from above. The other surprising and beautiful species growing in moister conditions, again on a steep grassy area near the pass were large golden bulbocodium. 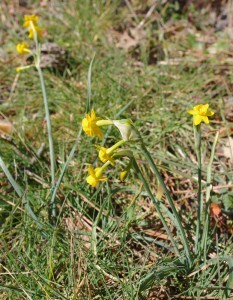 Could the flowers on the left be the much sought after Narcissus portensis? 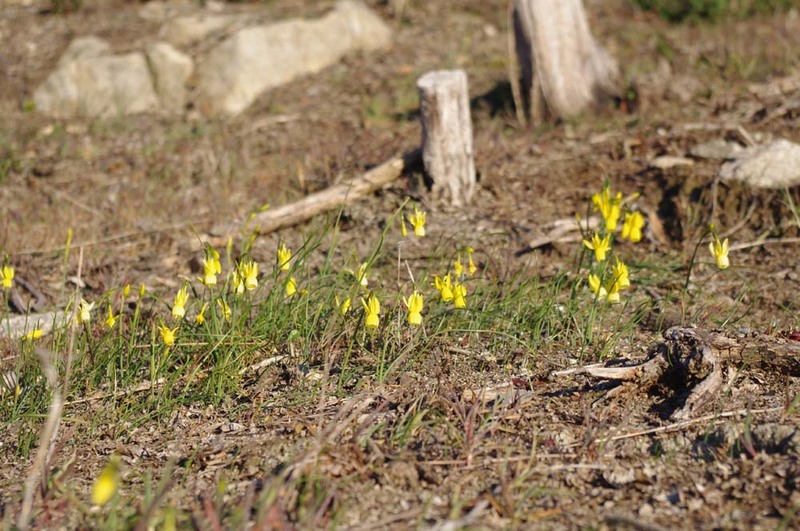 Imagine a bluebell wood in spring, then change the flowers to golden Triandrus lusitanicus and you have some idea of the effect of this pine wood. Absolutely enchanting. Even though the narcissus lusitanicus (N. concolor) look identical, Brian collected flowers of several which showed variation in form and colour even among this isolated population. 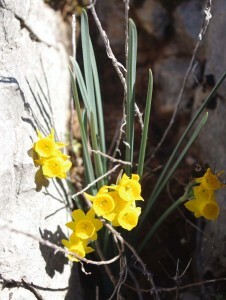 Our hope was that the snow had gone early from the heights of the Serra da Estrela, and it had, but only just. The grass was flat and straw coloured still. 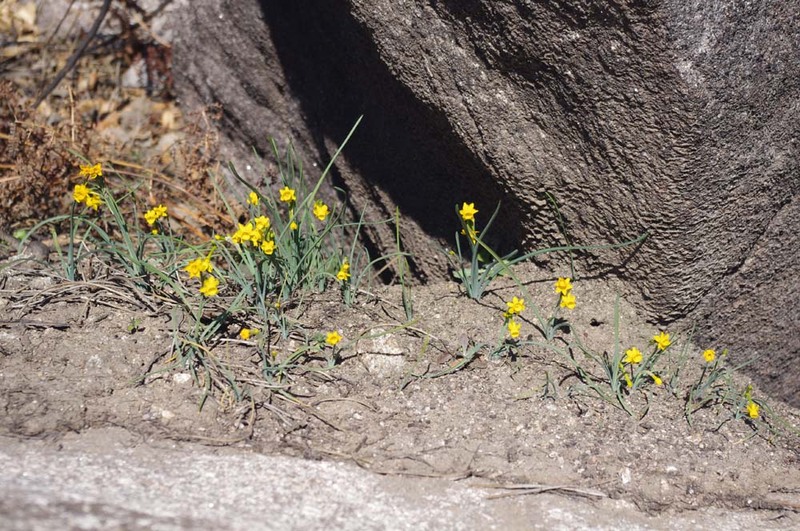 Carpets of N. asturiensis were flowering among the pancake shaped rocks on the southern slopes where we hoped to also see the tiny form of N. rupicola that we saw 8 years ago, but it was just too early. We briefly considered returning in two weeks but it wasn’t really possible with our crowded schedule which includes tulip book and display for April. 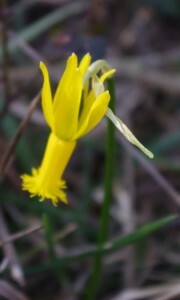 Our final two days were devoted to N. cyclamineus. We returned to the river valley at Nogueira and the river Alcofra. I was here two years ago and thought it was heaven, even though I didn’t make it to the top of the stone path where the flowers are. I didn’t make it again this time but almost. From where you park it’s 2000ft up, and up, hearing the river rushing unseen down on your left. At first you are among village houses and you can hear goats, baby goats, chickens, doves, dogs, women chatting and this time the bread van hooting. Then you rise into utter silence, there are walls to perch on and you could be in medieval Portugal. Just as my legs started to shake I saw a sign in sticks on the path to indicate I must leave the path and veer to the left but I turned it round and added a W to say I had gone back down. I think by this time we were all in touch with our inner child. 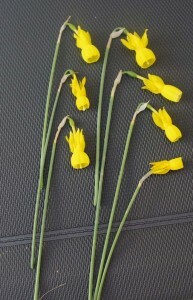 The others eventually caught up and handed over a bunch of the charming little flowers. I had always thought that the wine that comes from the vines that thread their way round every boundary and garden was Vino Verde but we found later that evening that it is Dao, a similar green wine. 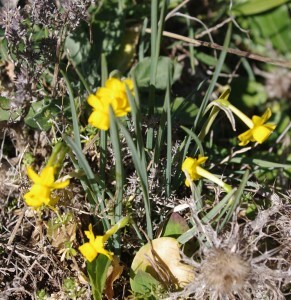 We tried two, one flowery and fragrant, the other like a mixture of wet boots and rotting grass. We drank it anyway. One day I shall make it to the top, in the meantime, here are the photos that James took. We did find a new site for cyclamineus at the side of the road as it was getting dark, further proof that they are spread over a much wider area, they just need spotting. There can’t be anywhere better than Portugal in February, plenty of daffodils and sunshine. Loved reading about, and seeing the photos of, your trip. Sounds wonderful. 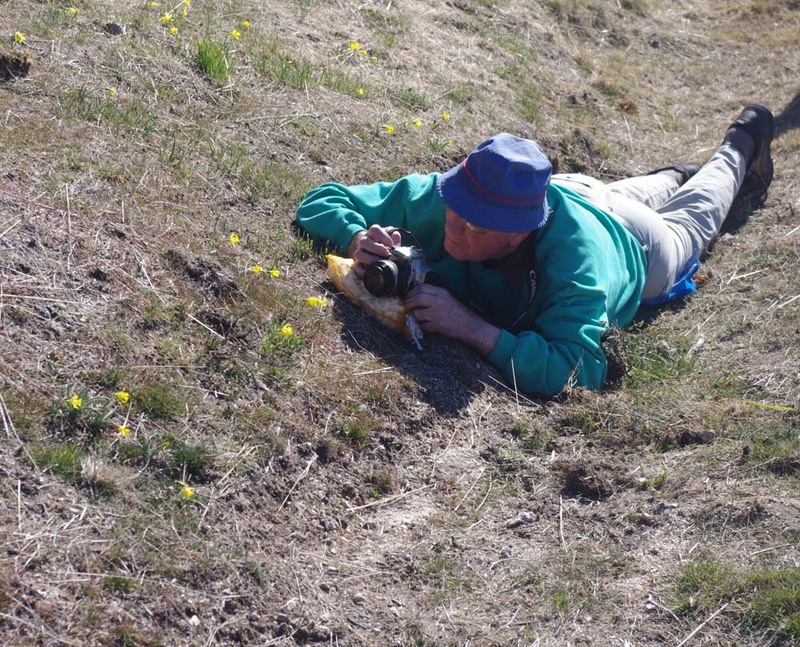 Really enjoyed your superb account and pictures of what was obviously a most exciting expedition. Thoroughly enjoyed the photos and wonderful commentary of your trip to Portugal. Fabulous advertisement for Portugal tourism everyone will want to travel there to see the daffodils. Wish it was me. I love all seven of the little N. triandrus subsp. lusitanicus that Brian picked. They are each so different. My favorite flower has to be the N. cyclamineus with the very toothy fringed edge. Would you happen to know if there are any for sale that looks like the one you saw on this trip to Portugal? I would love to purchase one like that beauty. 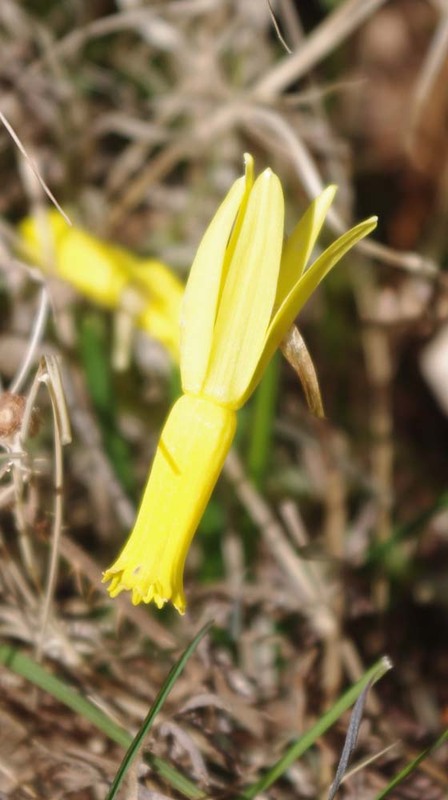 As Narcissus cyclamineus is a protected species there is no longer any mass collection of bulbs as took place in the past. 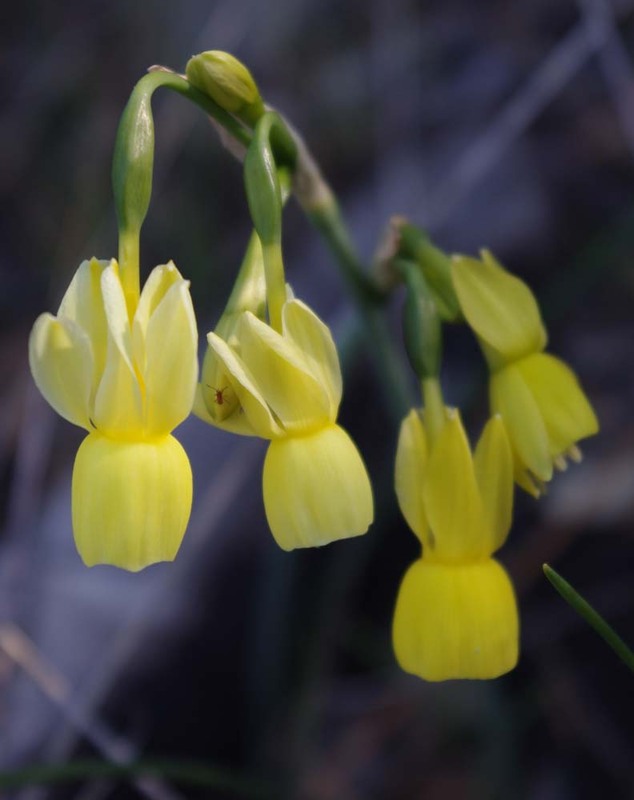 You are therefore dependent on buying bulbs which have been raised from seed which are very variable in form, as the ones found in the wild. 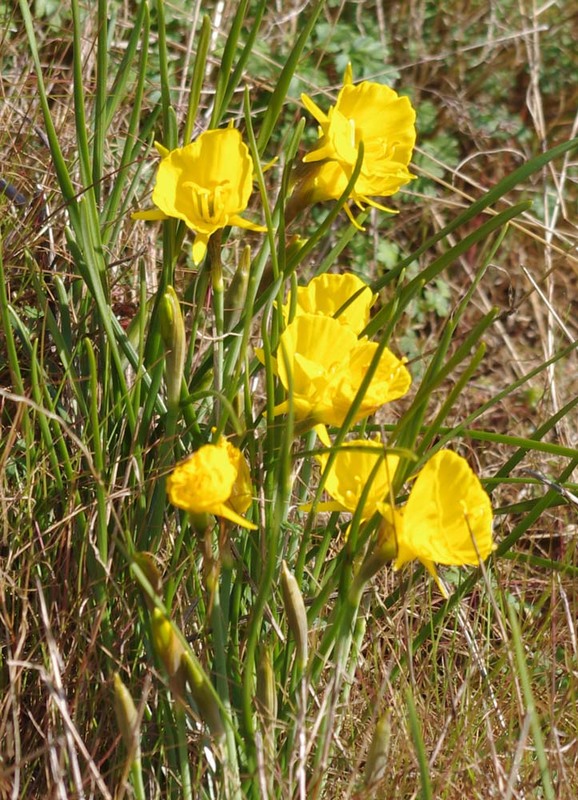 You might try Brian Duncan who grows a lot from seed, for his hybridisation, to see if he has any ‘greatly toothed’ forms among his bulbs. Enjoyed your report and pictures so much! 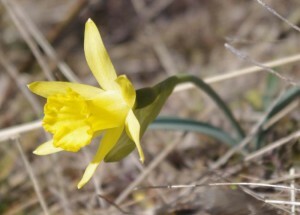 Is there anything nicer than a daffodil trek in early spring? Glad that you had such a nice trip. Mary Lou, Kathy Welsh and I fly out on Sunday night and expect to meet up with John, Brian et al. to see N. nevadensis. Hope the season in Spain is not like ours in the eastern US. We are at least 3 weeks early and fear we may have to cancel our show on April 14 – 4 weeks from tomorrow. 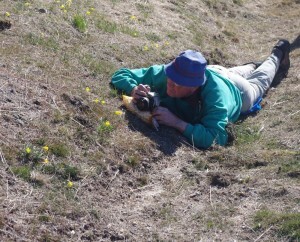 Many thanks for your great pictures and engaging narrative. Wonderful account of your travels; great pictures thank you so much for sharing with us!! Thank you for the wonderful report. Brought back happy memories of our trips together. How clever is the latest addition. Its hard to keep up!. 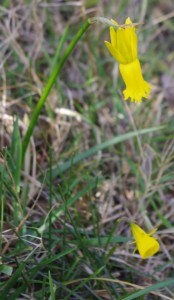 I have heaps of the toothed N cyclamineus. Getting them to you is more difficult. We could try some seed and hope it gives some toothed form. Interesting that if a strongly toothed Div 6 hybrid was entered in a show the judges would proably dismiss it as having a form fault. Thanks Wendy for the wonderful report of your trip. 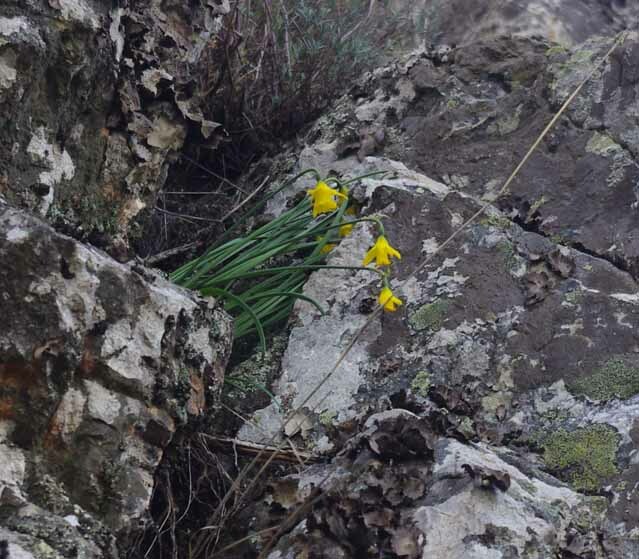 hi- my husband met some people on our land (near to the Serra d’Estrela) last year taking photos of the wild narcissus- i am wondering if it might have been you guys? If so, I really wish I had met you as I’m a garden designer and plantsperson living in the area . I hope you don’t mind but I am putting a link to this page from our new local Gardening group as I think it’s really useful and interesting! (I tried to contact you through your contact page but it doesn’t seem to be working).